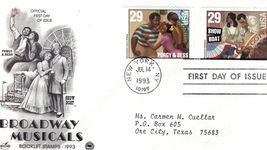 This is an exclusive limited edition commemorative cover producted by the Israel Stamp Collector's Society or The International Stamp Coin Collectors Society Celebrating Broadway Musicals Booklet Stamps 1993 for PORGY BESS and SHOWBOAT. 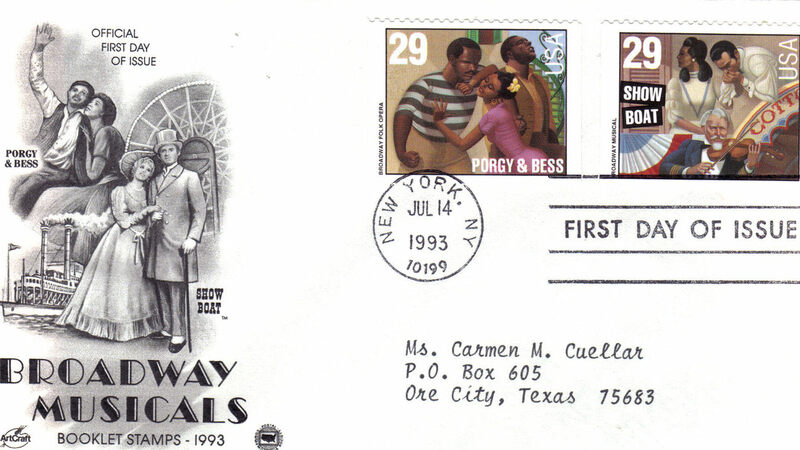 PORGY BESS is an Opera, 1st performed in 1935 with music by GEORGE GERSHWIN, libretto by DUBOSE HEYWARD lyrics by IRA GERSHWIN and DUBOSE HEYEARD, based on Dubose Hewyard's novel, PORGY. The work was not widely accepted in the US as a legitimate Opera until 1976 when the Houston Grand Opera production of Gershwin's complete score established it as an artistic triumph. SHOWBOAT is a musical in 2 acts with music by JEROME KERN book and lyrics by OSCAR HAMMERSTEIN II, based on the 1926 novel of the same name by EDNA FERBER. It is regarded as the 1st true American 'musical play', marking a significant departure from operettas, light musical comedies of the 1890s early 20th century the "Follies"-type of musical revuews that had defined Broadway. Measures 6-1/2" L x 3-5/8" H Excellent condition Send email if you need additional details. Buyer is responsible for 1.95 shipping to anywhere in the USA Canada. Do check the store for many more Las Vegas Collectibles daily. Thanks for stopping by!